So here we are in the Cinque Terre, land of alici marinate, foccacia, cozze, e pesto, yet the weekly pizza must be consumed. We literally stumbled into the place downstairs from our apartment as our only option this evening. It was my fault: I twisted my ankle hiking high above Vernazza during the day and deemed it best to stay close rather than stress the ankle further. All-in-all not a bad experience. 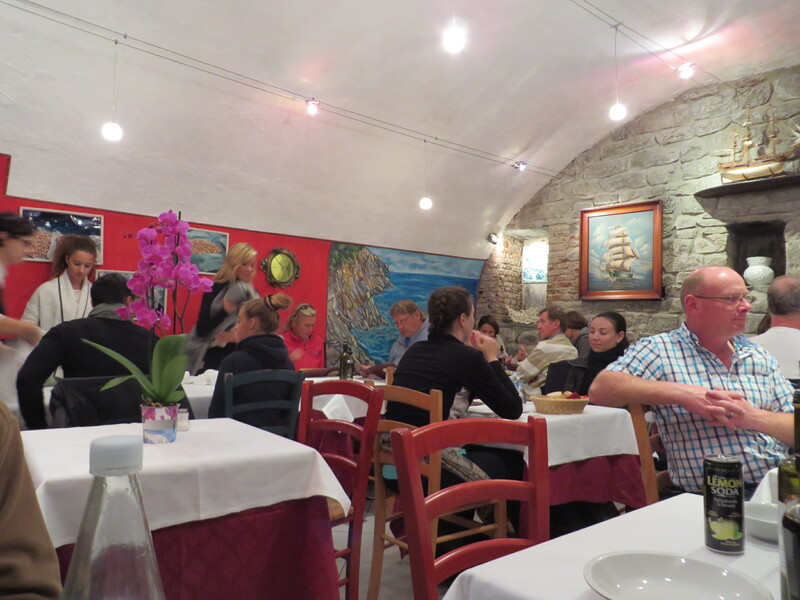 Trattoria La Scogliera (The Cliffs). Cute, nice service if a bit disorganized. 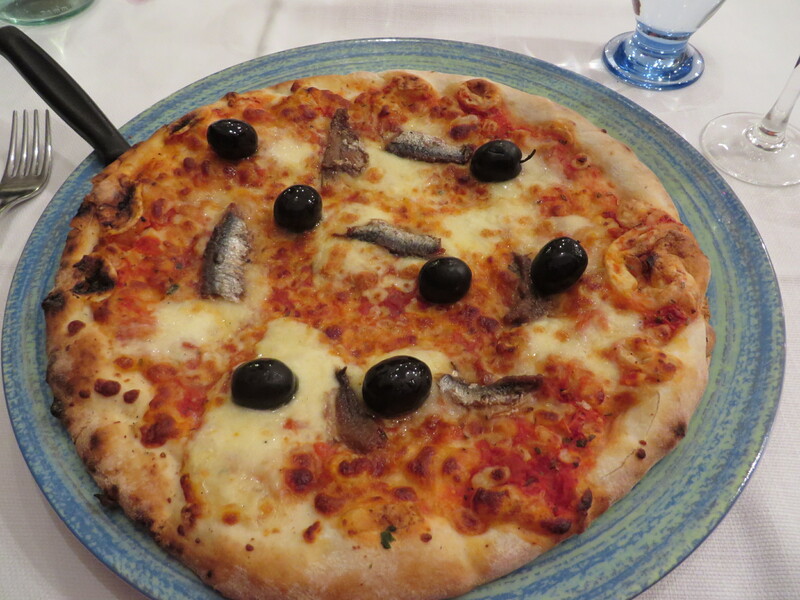 Pizza Napoletana con alici e olivi (anchovies and olives). The alici were a bit too salty on this one. 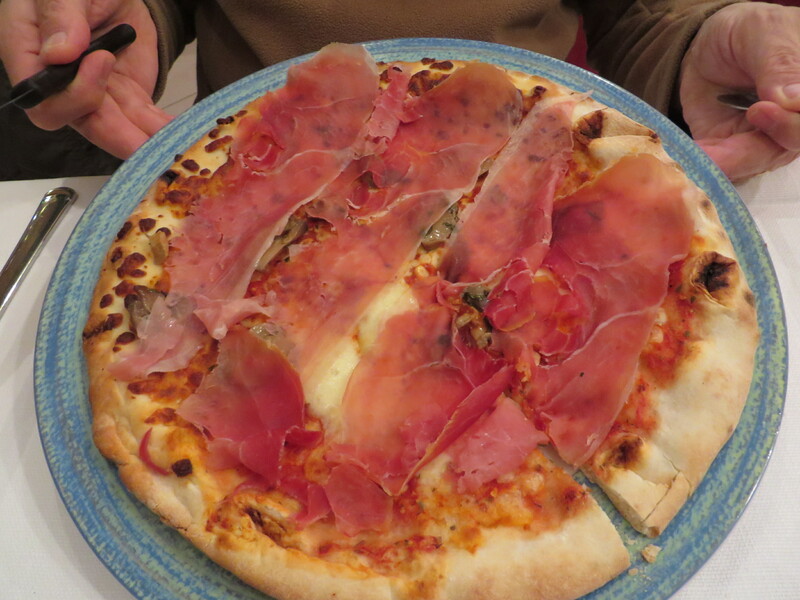 Pizza con funghi e cotto (mushrooms and prosciutto). Pizza Quality: 2 Tasty enough, but the crust nothing special, average ingredients, and small selection of pies not very creative. Service: 2 Nice people, family-oriented but a little slap-dash and disorganized as they tried to accommodate everyone including one waitress’s ill-behaved children who threw french fries at each other. Ambiance: 2 Cute place, sea-theme (surprise), with lots of nooks, outdoor seating, but some tables in the middle of traffic flow.